Why did I read this? 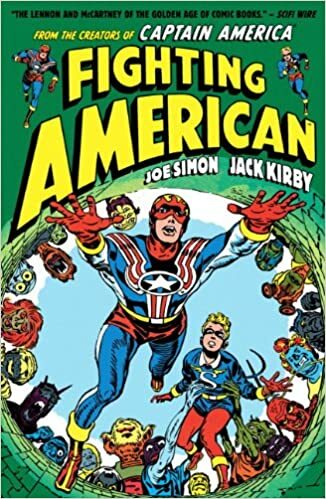 For a couple of reasons, first because it was written and drawn by a couple of graphic novel legends, Jack Kirby (who would be 100 today, August 28, 2017) and Joe Simon. My favorite comic book character is Captain America and Fighting American was created and published while Cap was on Hiatus in 1954. I was not impressed at all with this. It is way too goofy for me. This appeared campier to me than the 1966 Batman TV show with Adam West. Grade C, only because of who the creators are. Why did I read this? Because I read the first book in the series and was giving the author another chance. Once again Mason Kane is out for revenge and is single minded, hard headed and anti social. Someone in the administration is trying to pull the U.S. back into full scale war in the middle east. Mason Kane is supposed to be the main character in this series but to me he is the least interesting character in the story. Mr. David, Renee and Zeus are much more interesting and I look forward to when they appear in the story. Why did I read this? I am going to an event in Cannon Beach in May featuring five authors and Lev Grossman is the one I had never read anything from. Edward in getting ready to transfer from New York to London in his job as a financial planner when he is approached by an English couple to unpack and catalog a collection of books. Also he is supposed to see if he can locate a particular book in the collection. As he gets involved in sorting the collection he begins to wonder about the particular book and begins to do some research into the book and enlists some help from a scholar. He also gets involved in a MPORPG video game, which seems to tie in somehow to the book. As he gets further into things, the situation gets even stranger. I was completely befuddled by the ending of the book. I read the last four pages of the book at least three times to try and understand what happened.